Rice bran oil or coconut oil — is one healthier? There are some differences, especially when it comes to fat and vitamin content, but both are healthy dietary oils that may contribute to the health of your heart. Rice oil, or rice bran oil, is a byproduct from milling the rice bran kernel. Popular in Asian countries, rice bran oil has a nutty, delicate taste. The natural antioxidant property of rice bran oil makes it ideal for coating crackers, nuts and snacks to extend shelf life, according to the RiceBranOil site. Rice bran extract is also used in other ways, such as in the cosmetics industry. Coconut oil is made by extracting oil from the kernel, or copra, of the coconut. The coconut oil is purified, bleached and deodorized using steam. The wide variety of coconut oils available include virgin, liquid and cold-pressed, to name a few. According to Healthy Traditions, there is no recognized body regulating the difference between "extra virgin" and "virgin" coconut oil, as there is in the olive oil industry, so the different labels are only marketing ploys. There is a difference in the amount of saturated fats in coconut oil and rice bran oil. Rice bran oil has only 43 g of saturated fat per cup. Coconut oil has 179.8 g of saturated fat per cup. This amount, more than 90 percent of the total fat content, appears very high; the American Heart Association warns that eating foods containing saturated fats could contribute to heart disease. 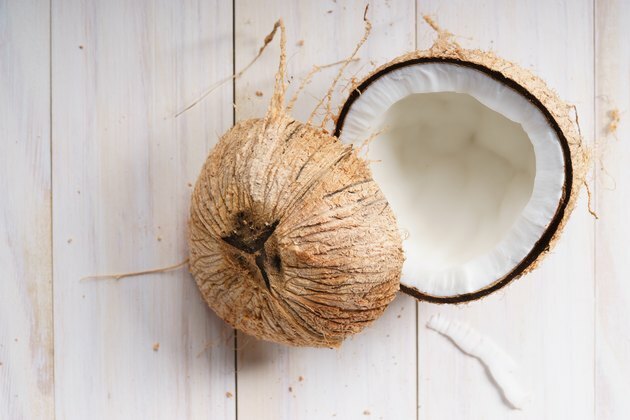 But the saturated fat in coconut oil is a unique type known as a medium-chain triglyceride, which actually makes it a healthy oil. When digested, medium-chain fatty acids are carried directly to the liver and burned like simple carbohydrates, so they are rarely stored in the body. Long-chain fatty acids are carried through the lymphatic system first. According to Healthline, foods with medium-chain fatty acids, like coconut oil, may have health benefits that include increasing energy, enhancing brain function, aiding weight loss and conferring an antimicrobial effect. Monounsaturated and polyunsaturated fats are the desired fats in a healthy diet. They help reduce LDL cholesterol levels in your blood and could lower your risk of heart disease. Coconut oil contains 13.8 g of monounsaturated fat per cup and 3.7 g of polyunsaturated fat. Rice bran oil has 85.6 grams of monounsaturated fat and 76.3 g of polyunsaturates per cup, which is an ideal ratio of almost 1:1. The American Heart Association says that oils rich in monounsaturated fats contain the antioxidant vitamin E. In fact, a cup of rice bran oil has upwards of 70 mg of vitamin E as compared to coconut oil, which has 0.24 mg per cup. Rice bran oil also has much more vitamin K, at 53.8 µg compared to coconut oil at 1.3 µg per cup. The most notable feature that rice bran oil has over coconut oil is the presence of a unique antioxidant compound called oryzanol, which acts as an anti-inflammatory, protecting cells from damage caused by unstable free radicals that are byproducts of normal cell metabolism. Biochemical and Biophysical Research Communications published a study that showed that oryzanol in rice bran oil had a significant anti-inflammatory effect in rats. A study in the Journal of Ophthalmology investigated the effect of oryzanol in the treatment of glaucoma. The conclusion was that oryzanol had anti-inflammatory properties that protected against glaucoma. The study suggested that treatment with oryzanol may reduce optic nerve damage. Coconut oil does not contain oryzanol. The smoke point of an oil is important, because after an oil gets too hot, it starts to break down and may no longer be good for consumption. Cooking for Engineers suggests that fats heated past their smoke point produce free radicals, which may contribute to the risk of cancer. Both coconut oil and rice bran oil are good for high-temperature cooking methods. Coconut oil has a smoke point of 350 degrees Fahrenheit; rice bran's smoke point is 490 degrees Fahrenheit. That means both oils are suitable for cooking foods at high temperatures and still remaining stable. Coconut oil and rice bran oil can be used for stir-fry meals, in baked goods and for frying foods. RiceBranOil: Why Rice Bran Oil? PubMed: Dietary Gamma Oryzanol Plays a Significant Role in the Anti-Inflammatory Activity of Rice Bran Oil by Decreasing Pro-Inflammatory Mediators Secreted by Peritoneal Macrophages of Rats. Healthy Traditions: What Is Virgin Coconut Oil?